But then I got the sad and shocking news that my dear friend Dale's husband, Mick, had passed away tonight--a vibrant and still-young man, deeply loved by his wife and sons. The death of a family member is never easy, but seems especially harsh right before a holiday. It felt altogether wrong for me to go with the original post I'd intended for today. So I lit two candles, one for Dale and one for Mick. Wishing them both light, love, warmth, wonder, and most of all, peace. Donations in memory of Mick MacIsaac can be made to the University of Ottawa Heart Institute. 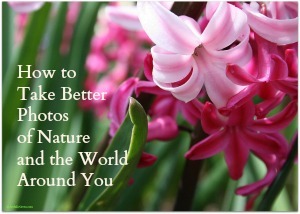 My photography e-course, "How to Take Better Photos of Nature and the World Around You" begins on January 5. Join me. © 2014 by Joy Sussman/JoyfullyGreen.com. All rights reserved. The photograph of Dale and Mick is the sole property of Dale Rogerson. All photos and text digitally fingerprinted and watermarked. Please do not use any of my photographs without asking me first for permission at JoyfullyGreen.com@gmail.com and then clearly linking back to this site with photo credits. Site licensed by Creative Commons. The Art of Photography: A Special Exhibition of My Students' Work!